2015 survey of California almond growers’ pollination practices. This is the third in a series of reports summarizing grower pollination practices in specialty crops around the United States. Previously, published reports focused on Michigan blueberry and Florida blueberry. 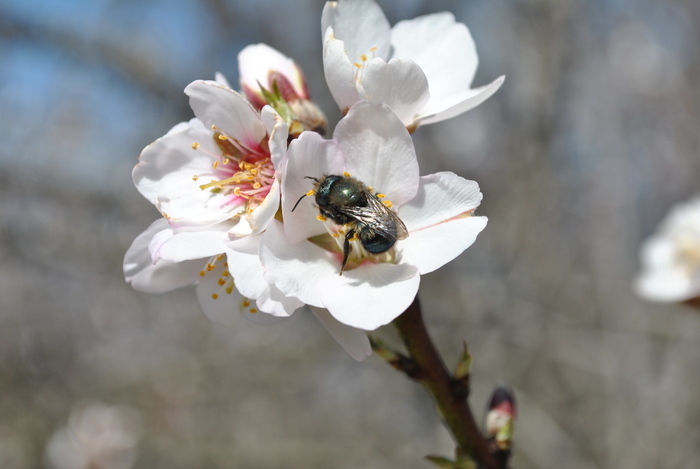 The survey of 550 almond growers in five California counties (Fresno, Glenn, Kern, Stanislaus, and Riverside) delved into growers’ goals for pollination management, networks of information sources about pollination, and past, current, and potential future practices related to managing and supporting pollinators in almond orchards. The large majority of CA almond growers depend on honey bees for pollination and, in general, rely on honey bees more than blueberry growers (93% of almond growers buy, rent, or own managed honey bees, compared with 79% of Michigan blueberry growers and 61% of Florida blueberry growers). On-going research aims to understand how to integrate honey bees with Blue Orchard Bees and wild, native bees to improve pollination. Many almond growers reported using reduced-risk pesticide practices to help protect pollinators. These practices included modifying spray times for pesticides and minimizing and choosing products with the least toxic active ingredient. Grower adoption of practices to increase forage and habitat resources for bees was modest; roughly 20% reported using practices that provide floral and nesting resources to attract diverse pollinators. The research team will be conducting a follow-up survey in winter 2016-2017 in California and other states surveyed in 2015 (including Michigan, Oregon, and Florida) to continue learning about pollination management practices.